That's right. My focus is on the Yakyu Dendo. A complete list of its members is here. The Meikyukai is only for players. (Here is the membership list.) Membership in the Meikyuaki is determined by whether or not a player has reached certain statistical milestones (ex 2000 hits), provided that they were born between 1926 and 1988. The Yakyu Dendo has its own problems (basically the same ones as the American hall of fame), but the hard in/out line on the basis of these particular milestones doesn't make sense to me. Ted Williams didn't get 3000 hits (the American version of this milestone), but he did have 2600 hits plus 2000 walks. The exception to the hard in/out line is actually the last guy that I posted: Ochiai. He hit the necessary milestones, but decided that he didn't want to be inducted. Tatsuro Hiroka played from 1954 to 1966 for the Giants, primarily at short stop. Frankly there's not much to say about this guy. He had a hell of a year as a rookie, but for his career he was offensively just sort of "meh". Given that he's in the hall of fame, I assume that he was a great defensive player, although defensive statistics for Japanese baseball in the 1950s either don't exist or I was unable to find them in a cursory internet search (or both). His one mark of real success for which documentation is available is as a manager. In 1976 Hiroka took over managing the Swallows and in two years they won the Japan Series. After leaving the Swallows he took over managing the Lions with whom he captured three pennants and two championships over four seasons. And then he was fired. Tough line of work. After leaving the Lions he moved into the front office, eventually becoming general manager of the Marines. In some ways Hiroka reminds me of Dave Concepcion; they were both light-hitting shortstops for powerhouse teams. Of course there are ways in which the two are disanalogous too; Hiroka's career was quite short, and he missed he heart of the Giants' great runs. He won the Japan Series four times as a player (and lost it four other times), so obvious he played for a great team, but he retired just as the O-N Cannon was gearing up for its historic run in the late 60s and early 70s. Concepcion is not in the hall of fame. He has his supporters, but it's hard to imagine him even having an argument for the hall if he had played only 13 seasons. I suspect that Hiroka's induction was something of a life-time achievement award. He was a player on a successful team, he had a successful (if short) managing career, and then he became an executive. I'm not sure that I'd put someone in the hall of fame for that, but it sounds like a pretty good life in baseball. Hisashi Yamada spent 20 years pitching for the Hankyu Braves, 1969 to 1988. Despite Japan's abbreviated seasons, he recorded very respectable amounts of innings pitched (peaking at 270 in 1971) and a very nice 3865 for his career. Given the sheer volume of his workload, it's no surprise that he had a large number of decisions. In a league where 200 wins is a hall-of-fame-worthy accomplishment, Yamada managed 284 wins. He was not merely a complier, though, Yamada also performed at an incredible level at his peak. He won three consecutive MVP awards. (I wonder if Japan has the same bias against pitchers winning the MVP award as MLB does? If so, this is an even more astonishing accomplishment.) Perhaps his longevity is due, in part, to having an easy submarine motion. You can see him pitching here. You should watch the video, it ends with a dramatic match-up between Yamada and Sadaharu Oh. It's hard to get the velocity expected of professional pitchers when throwing underhand, but if you can manage it it's a great way to relieve stress on your shoulder. Incidentally, I've always had a soft spot for guys with a delivery like this. Years ago I was a big fan of Jeff Innis, and now I always like seeing Darren O'Day warming up. The card is from the 1984 Calbee set. It's another one of the under-sized cards that Calbee produced in the 80s. Was there are reason that they made them so small? To package them with smaller bags of chips? Because it's cheaper? One interesting thing (to an American who doesn't know about these things) about this card is that it lists his last name (山田) before his first name (久志). This is, of course, common with Korean names, I didn't know that they do it this way in Japan as well. Last edited by nat; 06-05-2018 at 10:39 PM. Michinori Tsubouchi began his career in 1936 - the first year of professional Japanese baseball - and he retired after the 1951 season. In the early years Japan had split seasons - spring and fall. During the split seasons Tsubouchi played for Dai Tokyo and the Tokyo Lions (with whom he remained after they switched to a single baseball seasons each year). He spent the early 1940s playing for Asai, and then played for the Stars and Dragons in the late 40s. He was a contact hitter and a speedy leadoff-style batter. He struck out just 299 times in his career (in 6301 plate appearances), against 546 walks. While speed was his game, power was not. He had only a single season in which he made it into double-digits in home runs (barely: he hit 10) and hit an average of only two per year. On the surface his offensive statistics appear to be anemic, but early Japanese ball was a very low offense affair. In 1941 (to pick one season from his career at random) the league as a whole had a .201 batting average, a .299 on base percentage, and a .248 slugging percentage. * There were 26000 plate appearances that year, and yet the league managed only 549 doubles, 108 triples, and 100 home runs. In that context Tsubouchi's 237/343/294 line, with 10 doubles, a triple, and two home runs, looks pretty good. He made the first best nine in 1946. As for this card: I have only a guess as to what it is, and I'm not even sure that it's Tsubouchi. The seller that I bought it from listed it as Tsubouchi, and I've bought plenty of things from him with no problems, so I'm inclined to take his word for it. But I really don't know how he knows who it is. There is no writing on the card at all (besides the number 4 stamped on the back). You can't tell which team the player is on, and his face is hard to make out. Basically all you can tell about him is that he's wearing the number 1. My best guess is that it's a JBR 37 card, from the 1949 "Marusei Home Run Batter" set. Engel says that these cards usually, but not always, have text specifying the team and player. Here's his description of the Tsubouchi card from this set: "RHB, knees up, #1". Not much to go on. I don't know what 'knees up' means, but he is a RHB wearing #1, and it's possible that this is one of the JBR 37 cards without text on it. That's my best guess. If anyone has any better ideas, please let me know. I also might message the seller and ask how he knows that this is Tsubouchi. *An aside about on-base percentage and slugging percentage: it's very rare for someone to have a slugging percentage lower than their on-base percentage. Since any hit contributes to both, and any extra-base hit contributes a lot more to slugging than to on-base percentage, in order to pull this off you need to be a batter who takes lots of walks but who has no power at all. Brett Butler was the first guy that I thought of, and sure enough he pulled it off a few times, but it's pretty unusual. Tsubouchi's entire league did this. Curious to see if it's ever happened in MLB, I looked through the dead ball years, and found only one season. In 1918 the AL had an OBP of 324 and a SLG of 323. I'm pretty sure that's the only time an entire league in the US has done it. So the 1941 JPBL was like the dead ball era, except much more extreme. Thought I’d share a lttle old school round Menko. A two for one HOFer card ! My “collection” is more of a type set, with an occasional complete set, usually of older die cut or round menko. Love the schoolboy drawing illustrations. Color works for me. This particular disc is from 1948 and is part of the JRM 26 “Pinwheel” set. This disc is 3 1/2 inches in diameter, with all others in the set being 2 3/4. Like most other round menko, the disc is blank backed. The set is fairly common, with between 100 and 249 copies of each player disc assumed to be available. The Engel Chcklist is invaluable for a guy like me. I am terrible at languages and I rely on the guide to identify a card and player. P S... how can you have a slugging percentage lower than your on base percentage? Breaking my brain on that one! Last edited by drmondobueno; 06-08-2018 at 04:51 PM. My own theory is that there is a parallel to how Topps transitioned from its big size cards to the modern, smaller sized ones in 1957 when it no longer faced competition from Bowman. In the 70s Calbee had some competition, mainly from Yamakatsu which also produced sets. In 1979 Yamakatsu started making small cards and in 1980 left the market, which freed Calbee from competition (and showed them that small sets were feasible) from 1980 on. It wasn’t until Lotte and BBM entered the market that they went back to bigger card sizes. Last edited by seanofjapan; 06-08-2018 at 06:49 PM. Concerning the JBR37, my thoughts on trying to specify a card in a bromide set is to first, measure the card. I usually place the card in a semirigid holder to flatten and protect the card. I then measure the card and compare that to the set definitions I am considering. I do not pretend to be an expert but at least the use of research clues provided by the Engle guide is reasonable. Another comment: knees up, to me, may mean the photo shows the player only from knees up. I suspect the card may be from the JBR 74 or 75 set. Measuring may help define the card as the JBR 37 and 74/75 sets have a slight difference in their sizes. Wow! This is a spectacular collection interest. Curious if there are any cards of Victor Starffin? Starffin (1916-1957) was an ethnic Russian baseball player in Japan and the first professional pitcher in Japan to win three hundred games. With 83 career shutouts, he ranks number one all-time in Japanese professional baseball. In 1960, he became the first player elected to the Japanese Baseball Hall of Fame. In 1940, as xenophobia increased in Japan, Starffin was forced to change his name to Suda Hiroshi. Later, during World War II, wartime paranoia resulted in Starffin being placed in a detention camp at Karuizawa with diplomats and other foreign residents. 1957, Starffin was killed in a traffic accident when the car he was driving was struck by a tram in Setagaya, Tokyo. The exact circumstances of the incident are debated to this day, with speculation ranging from a simple accident to suicide or drunk driving. Thanks Keith. I think the pinwheel menkos are really attractive cards. Some of them are really common, but I've never seen that particular one before. Perhaps the rarity varies within the set. I just bought my first Kawakami card, so I'll have a write-up about him once it arrives from Japan. Regarding my "Tsubouchi" card. Turns out it is slightly too large to be JBR 37. It measures 2 and 1/8th by 2 and 3/8th inches. That's within the margin of error for JBR 74 (approximately 2 and 3/16ths by 2 and 5/16ths). JBR 75 is listed as approx. 2 1/16th by 2 3/16ths, although I imagine late 40s Japanese baseball card production wasn't exactly a precisions affair. I guess it could be the JBR 74 "full body" card - but the fact that there's no writing on the back tells pretty strongly against it. The 75 card description is given as "RHB full body, end of swing, legs crossed", which is fine except that his legs aren't crossed. It also doesn't have any writing on the card (despite the description given for the JBR 75 set), on the other hand the example card that Engel provides also doesn't have any writing on it. So one possibility is an uncatalogued JBR 75 card; and Engel explicitly says that his list is incomplete. He says that he suspects the set has about 500 cards in it, but that he's catalogued only 209. So an uncatalogued JBR 75 card that was cut a little large sounds like a possibility. And for anyone who is interested, I found a nice quick history of Japanese baseball here. Nice Starffin. Thanks for letting us see that one. I don't have any of his cards yet. But I do have Kenjiro Tamiya and he's the subject for today's post. He played 15 seasons, from 1949 to 1963, mostly with Osaka. He was a pitcher as a rookie, and a bad one. Surprisingly, it wasn't his terribleness that ended his pitching career, it was a shoulder injury. After that he converted to the outfield, although he still pitched a few innings here and there for the next several seasons. As a batter he had strong on-base skills and moderate power. From his stat line he looks like a "double into the gap" kind of guy, and he was reasonably fast, often among the league leaders in SB. Although he was a 7-time all-star and made five best-nine teams, his career totals are not especially impressive. If I needed an American player to compare him to, I come up with someone like Enos Slaughter, although that's probably not fair to Slaughter, as he missed what would have been some of his best seasons for the war. The card obviously belongs to one of a bunch of very similar menko sets released in the late 1950s. This one is probably from 1959, but I'm not sure which set it's from. None of the candidate sets has Tamiya paired with 90001 as a menko number. My guess is that this is an uncatalogued card from one of those very similar and (as far as I can tell) very common late 50s sets. It has a back stamp, but I don't know why. Sets that were imported to the US often were stamped on the back, and some sets similar to this one were imported, but I had this card shipped directly from Japan, so that's not it. Sometimes back stamps were part of a contest - if you got a stamped card you would win a premium card. That could be what's going on here, but it's really impossible to know. Atsuya Furuta was one of Japan's greatest catchers. He was a two-time MVP, a nine-time best-nine, and a 17-time all-star. He played 18 seasons with the Yakult Swallows. Despite the long career, he actually got a relatively late start. He was undrafted out of college, and went to play for Toyota's team instead. He did well enough in the industrial leagues that Yakult drafted him in the second round in 1990. He appeared in 106 games that year. Furuta excelled at every aspect of the game (well, except running, he was a catcher after all), winning a batting title and topping 30 home runs in a season (and more than 200 for his career). He was mentored by the great Katsuya Nomura, about whom more later. In addition to his work on the field, Furuta was both a manager (indeed, a player-manager) and the head of the Japanese Player's Union. He led a strike against the proposed merging of the Kintetsu Buffalos and the Orix Blue Wave. The merger went through, but the players got the owners to agree to add a new team to the league (and so not eliminate any roster spots). The length of the strike: two days. The card is from the 1992 BBM set. I don't care for the design: the brown border makes it look like 1987 Topps (one of my least favorite), but it's not even faux wood, it's brown with little bits of text saying 'BBM'. Anyway, this was close to the beginning of Furuta's career, he wouldn't retire until 2007. Katsuya Nomura is probably Oh's strongest competition for the greatest-of-all-time crown. He was a catcher who played 26 seasons, amassing 2901 hits, 657 home runs, and a 277/357/508 slash line. Did I mention that he was a catcher. I'm pretty sure that those hit and HR totals would be all-time records in America for a catcher. He walked almost as much as he struck out. His career lasted from 1954 to 1980, and was mostly spent with the Nankai Hawks. (Who play in Osaka, on the Pacific coast sort of on the southern half of Honshu. *) Nomura led the Pacific League in HR for eight consecutive seasons. Now, the impression I get is that the Pacific League is the Central's little brother, but eight in a row is damn impressive. Imagine Ralph Kiner, but have him lead the league in HRs another year, then make his career two-and-a-half times longer than it was, and then make him a catcher. That's Nomura. In addition to all that, he also had a long career as a manager. He took over managing Nankai when he was 35, and managed them until he left the team in 1977 (at age 42). He seems to have been retired through the 1980s, but in 1990 he took over managing duties at Yakult, moving on to Hanshin, and finally managing the Ratuken Golden Eagles until 2009, when he was 74. Nomura has a reputation as a difficult manager, and his teams' winning percentage is just about .500. *Funny note: I was looking around Google Maps and found that Google will let you review pretty much anything. The island of Honshu, yes the whole thing, has an average review of 3.9/5. The set is JCM 14g. The JCM 14 sets (there are many variations) get called the "Japanese T206", but I don't think that the nickname is very apt. They're really quite similar to many of the other 1960s menko sets, and don't have the iconic appeal of the T206 set. That's not to knock them, really. They're nice cards, with good color photographs (or at least colorized photographs, I'm not 100% sure). Regarding the project: I'm 35% of the way there, after picking up six new players today, so I'm running a bit behind on keeping this updated with my progress. He is also interesting due to his family - his wife Sachiyo Nomura (who passed away a few months ago) was very famous as an outspoken TV personality in Japan. She actually sunk his career as a manager with Hanshin - he had to resign after she was arrested (and later convicted) for tax evasion in 2001. She is also the mother of the agent Don Nomura who brought Hideo Nomo to the US (though Katsuya Nomura is his stepfather, not his biological father). The first card is from the 1963 JCM 14f collection. It can be tough to figure out what card is from what set, looking for clues like border or no border, color or tint of stock, text or no text on front, location of text, etc. And then there is the back of the cards. I must admit the backs got me interested. Kinda like dealing with the different back combos of the (in)famous T206 set which drove me batty for a few years before I came to my senses and moved on. The second card is of both Nomura and player number five with his back to Nomura, the runner. I understand the player is Katsuya. But I could easily be wrong about that. From the 1958 Doyusha Team Name Back borderless, catalog JCM30a. Love the color on this card, such a menko thing to do for a card. In 1963 I was an eleven year old (terrible) little leaguer in San Bernardino, CA. Our field had a fence but zero grass. The field got sprayed once a year with asphalt oil to keep the dust down between the rocks. I hated playing the infield. In 1958 I was six playing on a homemade field in an empty lot, El Centro CA. It was toooooooo hot to wear shoes, and worse not to wear them. You could find me out there every day I was not in school. Last edited by drmondobueno; 06-15-2018 at 04:47 PM. Reason: Sorry for the image size! Thanks for posting those Nomura cards! I especially like the bright red one. The player I've got for you today is Isao Harimoto. Japan's all-time hit king. In total he collected 3084 hits, and is the only player to pass 3000. Nomura is second and Oh is third. The record is in no danger, the active leader (Takahiro Arai) is 1000 hits behind him and is 40 years old. Kaz Matsui (yes, that Kaz Matsui) is second among active players. He spent most of his career with the Toei Flyers (who play way up north in Hokkaido). He was with them from 1959 to 1972. After that he bounced around for a bit, before retiring in 1981. This card is from relatively late in his career - 1976 - when he was with the Giants. Unlike Pete Rose, Harimoto was a big slugger. He finished his career with 504 home runs. He hit .319 for his career and walked more than he struck out. Harimoto's record is full of black ink. His .383 batting average was a Japanese record that stood for 16 years. He captured seven batting titles, and led the league in OBP nine times. Despite being fast (with more than 300 stolen bases) he as with many great offensive players, was not much of a fielder. Apparently he played a rather indifferent left field. Strangely he was only a one-time MVP (in the year that the Flyers won the Japan Series), but I suspect that the blame for this can be pinned on the fact that Japanese MVP awards, even more than American ones, tend to go to players on championship teams. Each player is, of course, unique, but I find thinking about comparable players as a helpful shorthand, since I know so many American players so well. It gives you a general impression, which can then be filled in with the details of the particular player's career. All that said, I think that a fair American counterpart for Harimoto would be Stan Musial. He is of Korean descent, and has worked as a commentator in the Korean baseball league. His parents moved to Japan while Korea was still a part of the Japanese Empire. Harimoto was five years old and living in Hiroshima when it was hit with an atomic bomb. He survived (his house was shielded by a mountain), but he lost a sister in the blast. On a related note, I've been fear-binging on this blog. It's written by a historian of science who studies the Manhattan Project, and it's both fascinating and terrifying. The card is from the enormous 1976 Calbee set. This really is a fascinating thread, thanks for sharing all of this biographical information and the cards, almost all of which I've never seen. It seems like a real labor of love, and I can definitely relate to and respect where you're coming from. Thanks for the kind words! I've been having a lot of fun with it. Frankly, I've been having more fun with Japanese cards than with American ones lately. I recently picked up a 34 Goudey Jimmie Foxx, which is a big pick-up by my standards, but it just felt like checking off a box. Having an excuse to learn about a completely new world of baseball, with it's own records and legends and quirks and so on, has been a lot more enjoyable. I'll post another update soon (probably tonight). And I've got several more cards on hand (and dozens more to get) so I plan to keep this going for a while. Tsuneo Horiuchi pitched for the Giants from 1966 to 1983. This was exactly the right time to be a Giant - he got in right at the start of their nine consecutive Japan Series wins. He broke in at 18 and was great immediately. In his rookie year he won both the Rookie of the Year Award and the Sawamura Award. As might be expected from a teenager who was suddenly a huge star, Horiuchi was a bit cocky and immature. Tetsuharu Kawakami, the Giants manager who sailed a famously tight ship, sent him to the minors to teach him a lesson, even though he was the reigning Sawamura winner. (source) The exile didn't last long. As a 19 year old Horiuchi was 12-2 in 149 IP. It was a hard pace to keep up: his last really good year was 1974 (when he was 26), he pitched his last full season at 30, and hung around until 35. This is a problem faced by any professional athlete, but it's got to be hard to retire at 35 and then have to figure out what you're going to do with the rest of your life. Anyway, Horiuchi did better with that than most. After retirement he was a coach with the Giants for years, and briefly their manager. And that's only the beginning. In 2010 he ran for parliament. Japan has a proportional representation system (like almost every democracy except the US): you vote for your party of choice, and then if, say, your party get 10% of the vote then they get 10% of the seats in the legislature. Horiuchi's party won 12 seats, but he was listed 13th on the party list. So he just missed out on getting a seat in parliament. BUT WAIT THERE'S MORE! Hirohiko Nakamura, one of the members of his party who did win a seat, died while in office, and Horiuchi was named as his replacement. So he got a seat in parliament after all. Here is a neat video of a game from 1966, Horiuchi's rookie year. He comes in as a relief pitcher at about 1:55, he's the guy wearing #21. The card is from the 1973 Calbee set. This was their first foray into baseball cards. In Japan 1991 marks the line between vintage and modern cards, so 1973 is much longer-ago for the Japanese hobby (such as it is) than it is for American card collectors. Calbee almost had a monopoly on baseball cards through the 70s and 80s - and they're still making cards today. This is the set where it all began, the 52 Topps of Japan, if you will. Last edited by nat; 06-18-2018 at 09:54 PM. You guys probably know this guy. Kazuhiro Sasaki was one of the more successful Japanese imports into the American game (and he saved my fantasy team's bacon in 2002). He was a two-time all-star for the Seattle Mariners, but before (and after) that he was a relief pitcher for the Yokohama Bay Stars, for whom he was a 6-time all-star. Sasaki had a 2.41 ERA in 627 NPB innings, and a 3.14 in 223 American League Innings. Once in America he continued a Japanese training program, which is much more intensive than the American version, and didn't endear him to the powers that be in Seattle. Sasaki isn't a great hall of fame choice. He was a dominant relief pitcher, but his career was short (by HOF standards), and he didn't pitch many innings. If you want an American to compare him to, I'll nominate Bruce Sutter. But then if it had been up to me they wouldn't have put Sutter in the hall either. Outside of baseball Sasaki seems to be an interesting guy. He was married to a singer and left her for an actress. He appeared as a witness for the defense when his friend, and former ballplayer, Kazuhiro Kiyohara, was arrested for possession of drugs. Jay Buhner taught him a bunch of dirty words. And he is now the general manager of the D'Station Racing Team (they drive Porches). But my favorite fact about Kazuhiro Sasaki is that he recorded and released a single of him doing vocals over canned electronic beats. It's terrible. The card is from the 2005 BBM set, after he returned to Japan and just before he retired. It's one of the newest cards in my collection. Shigeru Sugishita was a pitcher for the Dragons from 1949 to 1958, and then for the Orions in 1961. He was a high-peak short-career pitcher, winning the Sawamura award three times, and in 1954 (a year in which he went 32-12 with a 1.39 ERA) he also won the MVP award and the Japan Series MVP award. Unlike many pitchers with this career shape (e.g. Koufax) he wasn't felled by injury: he just wanted to do something else. He retired from pitching after the 1958 season to manage the Dragons, when that didn't go well he pitched one more year before getting another managing gig (which also didn't go well), and then moved into broadcasting. The card is a curious one. The front of the card is identical to the Sugishita card in the JCM 26 set, but the back of my card is blank. The JCM 26 set has a rock-paper-scissors symbol, a pillar with some writing, and a menko number at the bottom. Maybe my card is from the JCM 26 set but didn't get printed on the back? Maybe it's from a related set that's not catalogued? Hard to say. I haven't been posting anything lately because I'm on vacation, but such is my dedication to Japanese baseball cards that I've decided to ignore my wife rolling her eyes at me, and post something anyway. Kouji Yamamoto was an outfielder for the Hiroshima Toyo Carp from 1969 to 1986. If you look at his raw stats you'll think that he had a late peak (in his early 30s), but what actually happened is that the league's offensive environment changed pretty dramatically during his career. In 1971 the Central League posted an OPS of .640, by 1978 (while he was at his apparent peak) it was up to .764. (For the sake of a comparison, the NL was at .748 in 2017.) That's a big jump, and probably explains why he was hitting twice as many home runs per year in his 30s as he was in his 20s. Even though he began playing in a relatively low-scoring environment, Yamamoto managed to knock in 536 home runs (4th all-time), and cleared 2000 hits easily. In addition to being a great offensive player, he was a brilliant outfielder with a strong throwing arm. He won ten consecutive diamond gloves (the Japanese equivalent of the gold glove). After his playing days were over Mr. Red Helmet (not the most imaginative nickname, but then neither is 'ARod', so Americans can't really complain) had a couple stints managing the Carp (which included winning the Japan Series with them) and a couple stints as an announcer for them. Yamamoto is also a local, having been born in Hiroshima in 1946 (although he was drafted from Hosei University in Tokyo). The card is another one from the huge 76 Calbee set. To someone who grew up around Topps, Calbee cards often strike me as strange. This image isn't one that Topps would be likely to use for a card. There's another player featured prominently, it's weirdly cropped, it just looks like a strange image to use for a baseball card. But Calbee does this all the time. I may have mentioned this before, but Calbee cards often look to me like they're just stills from a broadcast of a game. There were a few Topps sets with unconventional image choices. 1973 Topps is one of my favorites, for precisely this reason. (Or at least half the set is. The other half is generic spring training pictures.) But the 73 Topps cards are cleverly unconventional, they're obviously carefully selected for their weirdness, whereas Calbee cards often strike me as just sort of random. This isn't to say that I dislike Calbee cards, far from it. Some are very well composed - like the Horiuchi card above. And as small of a thing as it is, I also appreciate it that Calbee uses high-quality card stock. I remember the first time I held a T201 and how I was surprised that anyone would print a baseball card on tissue paper. Fumio "Mr. Tiger" Fujimura was one of the first stars of Japanese professional baseball. Fujimura was extraordinarily versatile, beginning his career as a pitcher and playing a non-trivial number of games at every position except for SS and C. (And a trivial number of games at SS.) He had been a star pitcher in high school - famously striking out Kawakami three times in three at bats in one game - who led his team to the high school championships several years in a row. (High school baseball is a much bigger deal in Japan than it is in America. The finals of the Koshien tournament draw huge crowds.) He went pro rather than go to college, allegedly despite his own inclinations. Word is that his father signed his contract for him. Anyway, he was pitching for Osaka at 19 in 1936. Originally Japan split it's pro season in two: a spring and fall season. In the fall season of 1936 Fujimura had a slightly better than average ERA (2.54 to 2.84), but was a monster of a hitter, posting an OPS of .878 against a league average of .592. He also led the league in home runs, with two. Over the next several seasons Fujimura gradually transitioned into a position player, although he continued to pitch occasionally, and mostly in a relief capacity. Fujimura's career was interrupted twice for war; he served in the military from 1939 through 1942 (inclusive), and the 1945 season was canceled outright. He pitched 107 innings in 1946, but afterwards he would appear on the mound infrequently. It was in the post-war period that he found his greatest success. In 1949 he set a single-season HR record (since eclipsed) and the following year set a single-season hits record (again, since eclipsed). As his career was winding down in the late 50s he became a player-manager, and although posting a very good record (he has a career .584 winning percentage as a manager) he resigned in favor of Tadashi Wakabayashi. In addition to being a great player, Fujimura was a character and a fan favorite. He used an extraordinarily long bat (36 to 38 inches), and did his best to make a show of the game, by, e.g., making pickoff attempts at second base by throwing between his legs. For a more complete bio of Fujimura (from which this one, in part, borrows), see the one at thehanshintigers.com. The card is obviously a bromide, but it's not listed in Engel. There are a number of sets with a similar appearance, but it doesn't measure right to fit any of them. Presumably it is from the late 40s or early 50s, which would put it right around the peak of Fujimura's career. The back is blank. Shinichi Eto was a 1B/OF and occasionally a catcher who played for the Dragons, Orions, Whales, and one season with the Lions, from 1959 to 1976. Offensively he was a solid all-around player, eclipsing 2000 hits (by a small amount), hitting 367 home runs, and posting a career line of 287/358/484. His career began in the industrial leagues, but it was only two years before Chunichi drafted him. It was a good choice, he went on to be an 11x all-star, a 6x best-nine, and a 3x batting champion. Albright ranks him as the third-greatest player of the 1960s (after Oh and Nagashima), and regards him as tied for the 27th greatest player of all-time. Eto was, in some ways, a difficult person. His departure from the Dragons was a result of a dispute with his manager, Shigeru Mizuhara. After their run-in Eto retired (I guess out of spite) but changed his mind during the off-season. The Dragons, however, decided that their star was more trouble than he was worth, and traded him to the Lotte Orions. After he retired (for the second time) Eto ran a youth baseball academy, struggled with alcoholism, and died of liver cancer at the age of 70. I'm going to go out on a limb and say that the card is from the JCM 13c set. It's a pretty ordinary 1960s menko set. This card, however, is a good excuse for a little rumination on my part, so please bear with me. Grading, for better or for worse (okay: for worse) has a place in our Hobby. I wouldn't buy a 52 Mantle or a Goudey Ruth unless it was in a holder. But I'd like to be clear that I did not send this card in for grading; it, like all of my graded cards, was bought that way. Now, grading menko cards is preposterous for reasons that extend even beyond the ordinary problems with grading cards. This card was originally cut with scissors; whether in the factory, by a sales clerk, or by a little kid, I don't know, but menko cards are all hand cut. And there is simply no chance that a card which was cut with scissors half a century ago (and which subsequently found its way over the Pacific Ocean) has those edges. It's obvious that what happened here is that someone found a 1963 JCM 13c card of a hall of famer with wide borders, and took an exact-o knife and a T-square to it with the intention of submitting it for grading, in order to get a high grade and thus increase its value. (Didn't work: I paid less than $10 for this card.) I like baseball card collecting as a hobby, but I dislike everything about it that makes it a Hobby. And although it certainly looks nicer than it must have when it had wide borders and ragged edges, I like this card a lot less than I would have had I owned it in its original state. Every time I look at it I think that someone who was looking for a quick buck mutilated this card. I've even thought about cracking it out of it's case and scuffing up those perfect corners, but that wouldn't help any, I'd just remember that I was the one who had done that. So in its plastic tomb it stays. Most of my cards are in binders, but my handful of graded cards are on display (since they won't fit in binders). Having a Japanese card on display makes for a nice conversation piece. Now, anyone who is likely to be a guest at my house is already aware that I'm a dork, but this card will confirm for them that I'm at least a cosmopolitan dork. I agree about the photography, its way different from what Topps used but I much prefer it to the spring training posed shots that dominated in the 70s. Last edited by seanofjapan; 07-04-2018 at 08:51 PM. I am in 100% agreement with you on graded cards. One thing I do like about the Japanese hobby is that almost nobody here gets their cards graded, as evidenced by the sparse populations of graded cards from the classic sets on PSA. Another reason it makes so little sense with regard to Menko is that those cards were specifically designed to be damaged by kids throwing them at the ground! So the menko cards were all hand cut? The very few I have were bought all together as a flea market lot, and they all seemed factory cut to me. I wouldn't have even thought they were cut by hand. "So the menko cards were all hand cut?" Sean: I took a look at your blog links. So they literally took stills from TV broadcasts. That's really amazing. And they'd been at this for 15 years at that point, you think that they would have a regular source for photos lined up by then. No new cards for today, but what I do have is a map with the location of each of the current Japanese teams marked on it. Central League teams are at the top, Pacific League teams below. I hope that the color coding is clear enough. There are some exceptions here*, for instance, the Fighters occasionally play "home" games in Tokyo. In fact, you'll notice that a LOT of teams call the greater Tokyo metro area home. Which, I suppose, makes sense given the population density. Japan has 127 million people (so, a bit under half of the US population) squeezed into 145 thousand square miles (roughly the size of Montana, a bit smaller than California). AND, the middle of the county is full of mountains. That makes for a lot of people all in the same place. *The Buffaloes have two home fields. They're close together, but I've marked them both. Yeah, it’s pretty crazy that they went so far as using TV screen shots. You could almost make a hobby solely out of cataloging odd photo choices by Calbee! About the Menko, I have come across more recent (1980s) ones that were factory cut, but I am pretty sure most or all of the vintage stuff pre 70s were sold as sheets and then cut by hand. I can’t say for sure that all were as there might have been the occasional exception, but that was definitely the standard practice. Morimichi Takagi had a 21 year career playing for the Dragons. He was a second baseman with some power and some speed, but no on-base skills. Takagi started out as a lead-off type hitter, stealing 50 bases as a 21 year old in 1963, but over time his speed dropped off and power developed. (This is pretty normal as players age.) But he never did develop a lot of power, topping 20 HRs in a season only twice. Seven times he was selected for the best-nine, which is a record (shared with Chiba, more on him in a future post) for second basemen. After retiring he managed the Dragons on-and-off, posting a total winning percentage of .524, and retiring for (I assume) the last time in 2013. The card is an uncatalogued menko. It has the same size and shape as the "pillar" menkos that were popular in the late 1940s, but this card is obviously much newer than that. (Not least because Takagi didn't start playing until 1960.) The guy I bought it from thinks it's from the 60s; I suppose that's a good guess, if for no other reason than not many baseball menko sets were made in the 1970s. I really have to scan mine. I have all of one baseball player menko, the rest of the handful are non-sports. I'd really like to be able to at least name the subjects. I think they're late 50's. I found the baseball player at one point a few years back, but have forgotten who he is. Got to remember to write it down next time I find out. 1973 were not Calbee's first cards, they actually produced some in the early 1950s that are quite difficult to get (I don't have any). On Keith's Katsuya Nomura card from 1958, the other player wearing #5 that is greeting Nomura at home plate is not Katsuya (that is Nomura's first name) but outfielder Yoshio Anabuki. Anabuki later managed the Hawks and he also appears in the 1967 Kabaya-Leaf set. Isao Harimoto played his entire career in the Tokyo area with the Flyers/Fighters, Giants, and Orions. The Flyers/Fighters were always in Tokyo until moving to the Sapporo Dome on Hokkaido in recent years, and the Orions were in Kawasaki which is in the Tokyo area. The Koji Yamamoto card is from the 1976 All-Star Series and shows him scoring for the Central League with Pacific League catcher Katsuya Nomura in the background. The Morimichi Takagi card cannot be from the 1960s since the Dragons first wore the uniform with the shoulder and side blue stripes in their pennant winning year of 1974. There are a number of anonymous menko issues from the mid-70s, and many of them were made using pirated Calbee photos that had already been issued as Calbee cards. The photos will usually lack clarity since they are photos of photos and will never have a printer's name on them. Finally, I would like to make a comment about the cutting of menko cards. These cards that were issued from the mid to late 1950s through 1964 were not released as singles but came in uncut form in various amounts- 2, 4, 6, cards etc. The cutting was done by the purchaser, and some can still be found in uncut form. The cover of Gary Engel's 6th edition guide shows a display of uncut cards as they would have been available in a shop. As an obvious result, the cards have various dimensions and can be found with wider borders on the sides or top, angled cuts, etc. As a general rule, the cards that were not imported to the USA in the 1960s tend to have less uniform dimensions and the cuts can range all over the place. However, the sets that were imported in the 1960s were carefully cut and are much more standardized in size and overall condition. They were sold in set form to collectors here and many remained together as sets for decades and were never played with by Japanese children. The collectors that brought these menko cards here at the time they were released in Japan, along with the 1964 Morinaga Top Star cards, Fujiya Gum cards and the 1967 Kabaya-Leaf cards, were Bud Ackerman and Mel Bailey. Bud was responsible for the menkos that came here and Mel brought the Morinaga, Fujiya, and Kabaya-Leaf. The Shinichi Eto card shown in the graded holder has the stamped number 9 on the back. Bud and his family cut these cards and stamped a number on the back of each card. When they sold the sets a numbered checklist that corresponded to the stamped number on each card was provided to the purchaser. Anytime one of these cards is found with the stamped number on the back it went straight from the shop to the Ackerman's house where it was cut, stamped, and bundled into sets of 40 different and sold to collectors in the USA that way. The result is ,of course, that the imported menkos, Kabaya-Leaf cards, Morinaga Top Star and Fujiya Gum cards are usually in pretty good condition since they were never owned by the general public but were bought by Bud Ackerman or Mel Bailey from shops in Japan or direct from the producer (in the case of most of the Kabaya-Leaf cards). There should be no fear that this card was cut down from a ragged form to get a grade. All of the imported menko cards I have are in the same condition, and the cuts are quite uniform with only a few variances. This should also account for why the cards found by Steve at a flea market were cut so well- if they were some of the imported cards brought in by Bud or Mel in the 1960s. I hope that this information is of interest, and please continue this great series, I love seeing cards I do not have and reading everyone's contributions. I only have a few Japanese cards, less than 10 baseball for sure. But they're interesting and I like learning more about them. I'm guessing mine were brought in, as they're cut well enough I'd always thought they were factory done. Great post Jeff, that is particularly interesting about Bud Ackerman and Mel Bailey. Hi Jeff - Thanks for all the info! So my Takagi card is a mid 70s rip-off from Calbee? That's pretty interesting (and late for a baseball menko). Thank you also for the information about the Eto card. I knew that some sets were imported in bulk, but I usually buy cards directly from Japan so it didn't occur to me to check to see if this set was one of the ones that was imported. (Guess I should do that when buying cards from Americans.) Cards sold directly to Hobbyists is still too capital-H Hobby for my tastes, but I'm glad that it wasn't cut down for grading purposes. Today's card is of the newest hall of famer. Tatsunori Hara was inducted just this year. Hara played 15 seasons (1981 to 1995) for the Giants. He was a third baseman - a contemporary of, and with basically the same offensive profile as, George Brett. Like Brett, he was a 1x MVP and many-time all-star (11x in Hara's case). * Despite a career that eventually landed him in the Hall of Fame, Hara was considered something of a disappointment. He was one of the hottest prospects ever, and was expected to replace the production of the recently-retired Oh. He was good (and won the rookie of the year award his first year), but, come on, he wasn't that good. *The Brett comparison is the first one that came to mind, but Brett was actually the better player. Hara couldn't manage the kinds of batting average that Brett could, and unlike Brett he struck out more than he walked. Post playing days, he became a manager, holding the reins for the Giants for ten seasons, as well as managing Japan in the World Baseball Classic. "As a little boy, I loved baseball," Hara said. "And naturally, I dreamed of being a pro. But even in my wildest dreams I didn't imagine this. I was nothing special as a player, but I think the managing may have had something to do with this." And here's a video of Hara from 1992, batting against Akimitsu Ito of the Swallows. The card is from the 1985 Calbee set. Tokuji Iida was a Hawk and a Swallow over a 17 year career, from 1947 to 1963. He just missed collecting 2000 hits (no Golden Player Club for you, not that it existed when he retired). Iida was a slugging first baseman who played through Japan's deadball era. His raw home run totals don't look impressive (after 1955 he never even made it into double digits), but no one at the time was hitting home runs, or much of anything else. For example, in 1957 he slugged .417 against a league average of .329. Last year the National League slugged .423. Iida's slugging percentage was 88 points better than league average; you would have to slug .511 to top last year's average by 88 points. That's, basically, Anthony Rizzo. But raw comparison's aren't really the way to do this. In 1957 (a year in which he hit 9 home runs) Iida had a slugging percentage that was 27% higher than league average. To match that in last year's National League you would need to slug .537, exactly what Kris Bryant did. So one way to think about Iida is that, even in the years in which he was hitting home runs in the singe-digits, he was, in context, hitting as well as Kris Bryant. Lest you think that maybe he was a one-dimensional power hitter (like, e.g., Rob Deer), note that his on-base percentage was 25% better than league average that year as well. Which is, again, a perfect match for Bryant. So, basically, Iida was Kris Bryant, albeit at 1B rather than 3B, for 17 years. He won the 1955 MVP award, but he does not seem to be well-remembered. He doesn't even have his own Wikipedia page. People who follow Japanese baseball apparently regard him highly though - thehanshintigers.com ranks him as one of the Hawks' five best players, and Jim Allen ranks him as the second best defensive first baseman of all time. (Although seventy year old defensive statistics should always be taken with a pretty good spoonful of salt.) Allen also ranks him as the 60th greatest player of all time. He was famous for a long consecutive-game streak (this is basically the only thing that the Japanese Hall of Fame website says about him), but he missed a bunch of games late in his career, presumably with injuries. Maybe a day off now and then would have been a good idea. I like to find video of the players that I write about, but youtube has nothing for Iida. If you search "Tokuji Iida" on youtube the only hit you get is from an old Japanese movie called "The Burden of Life", which sounds a bit heavy for a baseball message board. The Iida card is from the JCM 31b (type II) set. I forgot to take a picture of the back, but I think you folks can deal with just a photo of the front. Also, it's time to report some progress. I'm now 51% of the way to my goal! On June 1st I was at 25%, so I've picked up another quarter of the hall of fame (at least, those who are in as pro players, and so for whom there are probably cards) in the past 41 days. I'll call that progress. Surely it helps that most of my cards are low grade, but this remains a (relatively) inexpensive project. I still have a couple American cards that cost more than my entire Japanese collection. Manabu Kitabeppu pitched for the Carp for 19 seasons, 1976 to 1994. He broke in when he was just 18 years old. It's got to be crazy being that young and playing on the biggest stage. (Then of course there's Joe Nuxhall. I doubt anyone else had eight years between big league appearances.) Kitabeppu won 213 games with a 3.67 career ERA. I don't know of any website that has league ERA for ranges of seasons available; it's possible to calculate it from the data available for individual seasons, but that sounds pretty tedious. Suffice it to say that, looking over a bunch of years during Kitabeppu's career, 3.67 is a bit better than league average, but not super impressive. He's got a weird career shape. He was super good occasionally - he won an MVP award and a pair of Sawamura awards - but he mixed in a bunch of clunkers. Sort of like Zack Greinke, or, to take a much more extreme example, Steve Carlton. He was sent to the minor leagues for the first time in 1989, when he was 31 after a rough patch. He would post two more good years, but he was done at 36. Albright does not list him on his ranking of the top 115 (what a weird number to stop at) Japanese players. In all he's kind of an unexciting hall of famer. The Greinke comparison is probably a good one. They're both fine pitchers, if what's his name who is on the Phillies now hadn't gone bonkers in the second half Greinke would have two Cy Young awards also. But they're not the kind of guys whose starts I make it a point to watch. On the other hand, Wikipedia says that he was one of the most popular right-handed pitchers ever. Now, it's possible that that was written by his mother, but it's also possible that he was a much more exciting pitcher than his statistics indicate. YouTube doesn't seem to have any videos of him playing. Which is a surprise, given how recently he retired. It does have a short and boring interview with him from 2012, filmed a charity golf tournament. I'll spare you the link, but basically he tells kids that if they want to be good at baseball they need to practice every day. The card is from the inaugural 1991 BBM set. Looking at his card I just noticed that the kanji for "strikeout" just means "three", which is commendably to the point. The symbol that they use for "walk" - Nishi - means "west". I guess home plate is to the north? Eventually I'll probably end up with some more BBM cards, but I've now posted all of those that I've got on hand. It'll be back to menkos and bromides (and a few Calbees) for the near future. Last edited by nat; 07-13-2018 at 10:24 PM. Thanks for posting this. Great looking card of a key member of those great Giants teams! Yoshida came from a poor family, and was orphaned while he was still young. (He was raised by his older brother after his parents died.) Unable to afford tuition he didn’t plan on attending college, until his baseball prowess gained the attention of recruiters and he was offered a scholarship. He was scouted by the Braves, but a large offer from the Tigers convinced him to drop out of school and go pro. The really interesting thing about Yoshida, however, isn’t what he did on the baseball diamond. After he retired he managed the Tigers on-and-off, but he also went to France to develop a baseball program. Yes, France. He said that when he arrived in France the level of play was abysmal, comparable to high school ball in Japan. But under Yoshida’s influence the French national team now participates in the World Baseball Classic, the European Baseball Cup, and other international competitions. In fact, France hosts an international competition (open apparently by invitation to a few European nations and Japan) called the “Yoshida Challenge”. Yoshida is an honorary member of the French Baseball and Softball Federation. He recently (c. 2014) arranged to have some French players train with Hanshin. The French national baseball team is now ranked 23rd in the world. Which might not sound very impressive, but it’s a lot better than high school ball. As you might expect, thehanshintigers.com has a very good biography of Yoshida. Much better than what I’ve got here. You might want to go read it. I'm not sure what set the card belongs to. It resembles JBR 17 and JBR 29. But it has a border. It could be from a related but uncatalogued set. 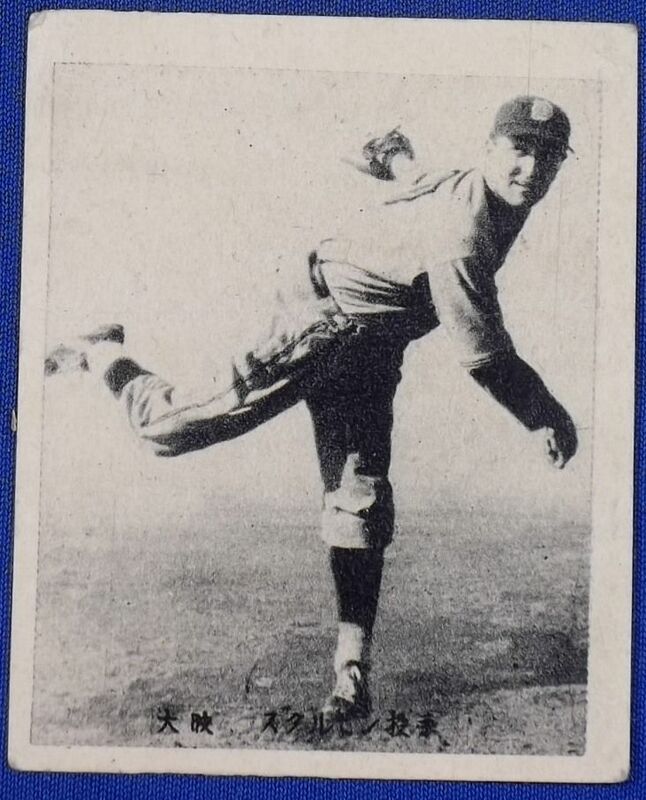 Jiro Noguchi pitched for a few teams from 1939 to 1943 (the Japanese Wikipedia page seems to indicate just two teams that changed their names, but I'm not super confident about how I'm reading it), and for Hankyu from 1946 to 1952. The beginning of his career was the best part. As a rookie he posted a 2.04 ERA (against a league average of 2.50), and then proceeded to post sub-1 ERAs for the next two seasons (at ages 20 and 21). Pitching for Taiyo in 1942 he had his most remarkable season. Noguchi pitched 527 innings (!) and notched a 40-17 record. But his 1.19 ERA was only fifth in the league. At one point in 1942 he pitched a 28 inning complete game. In 1944 he was drafted and went to war. He wouldn’t have had an opportunity to pitch in 1945 even if he wasn’t enlisted, as the season was simply canceled. After the war he was still good, but declined quickly. Although he hung on for a couple years afterwards, he was essentially done at age 30. The entire Noguchi clan was athletic. His older brother Akira was a star baseball player: he made four all-star teams and had one best-nine selection. Younger brothers Noboru and Wataru made brief appearances as professional ball players as well. To be fair, though, Noboru didn’t get much of a chance. He was drafted into the Army and died in the Philippines in 1945. Apparently someone made a television special about the family. In addition to being one of Japan’s great pitchers, Noguchi was a good hitter for a pitcher. Some seasons he was simply a good hitter, no “for a pitcher” required. For instance, in 1946 he posted a .708 OPS against a league average of .676. In fact, he was fourth in his team in OPS, among those who had a significant number of at bats. The card is an early post-war menko card. It’s from the JCM 22 set, issued in 1947. This was the first year after the war that any baseball cards were issued. And it has definitely seen some play: the edges, especially at the top, are kind of squashed. It looks like it flipped over a fair number of cards in its day. Tsutomu Wakamatsu was an outfielder (switching between left and center) for the Yakult Swallows from 1971 to 1989. He had moderate power but high batting averages and a good walk/K rate. His career line is 319/375/481. If memory serves, that .319 batting average is tied for second best all-time in Japan. And he did it over an impressive 7500 plate appearances. He could steal a base, but that wasn’t his game exactly. Offensively he’s the same sort of player that Derek Jeter was. (Of course defensively there’s a position difference to consider.) Wakamatsu was a consistently excellent player. He made the all-star team 11 times, and was named to 10 best nines. Which is really good; it indicates that those all-star selections weren’t of the “well, we need to fill out the team, so why not this guy?” variety. Like Jeter he was a multi-gold glove winner (although only 2 in his case), although Jeter didn’t really deserve his hardware. And unlike Jeter, he won an MVP award. At least in so far as their on-field production goes. I’m fairly sure that Jeter’s cultural impact was larger than Wakamatsu’s, at least given that Wakamatsu doesn’t even have a Japanese Wikipedia page. Albright tried to come up with something like MLE’s for Japanese baseball. * Given those, he lists Enos Slaughter, Tim Raines, Jose Cruz, Griffey Sr., Bill Buckner, Buddy Bell, and some other non-exciting players as comparables. As with many great players, Wakamatsu went into coaching and managing after his retirement as an active player. He served several years in the minor leagues; managing the Swallows for seven years he posted a W/L record slightly above .500. *MLE = major league equivalent. It’s one of the tools that we use to evaluate minor league players. Basically, MLEs try to determine what a player who does X in league Y would do if they were in the big leagues. It must be nightmarishly difficult to do this for Japanese players, given the dearth of data points. Here is a video the Swallows played at the stadium during their “Wakamatsu Day” following his retirement. My Wakamatsu card is from the 1974/75 Calbee set. Another poster showed some Starfin cards earlier in the thread, but I’ve got one now so I’m going to give him a full write-up. Victor Starfin was a pitcher from 1936 to 1955. He was the second greatest pitcher in Japanese history, and Walter Johnson is, in a number of ways, a good American analogue for him. Before the war he played for the Kyojin – I assume that this is the same team now known as the ‘Giants’. After the war he moved around a bit but spent the better part of his time playing for the Stars. Starfin was the first Japanese player to win 300 games (retiring with 303), he had a career ERA of 2.09 (in an admittedly low-scoring environment), and he still holds the all-time record for shutouts in Japan. At the height of his career he was pitching an insane number of innings: 458 in 1939 (the first year in which the season was not split in two) and 436 in 1940. In the latter year he recorded an ERA of 0.97. He won consecutive MVP awards. Take that Bob Gibson. As you might have guessed, Starfin wasn’t Japanese. He was Russian, born into an aristocratic family that sided against the Bolsheviks during the revolution. As the Bolsheviks swept to power, the Starfin family fled before them, first to Siberia, then to China, and eventually settling in Hokkaido. My guess is that he was about two years old when they left Russia and something like seven or eight when they finally arrived in Japan. It seems that his position in Japan was somewhat precarious. The family entered on transit visas, which would probably have made living there long term a dicey legal proposition. Wikipedia reports that the owner of the team (Matsutaro Shoriki) who signed him effectively blackmailed him into going pro, as he could have had the family deported. Starfin named his son ‘George’, after Babe Ruth. Amazingly there is video of Starfin pitching. Here he is in 1949. My card is a bromide from the JBR53 set, issued in 1949. Although you can’t really make out the uniform, that would put him on the Stars. Osamu Higashio pitched for various incarnations of the Lions from 1969 to 1988. His career win-loss percentage is uninspiring (251/247) and a career ERA of 3.50 is good but not outstanding. To be fair, though, 251 is a large number of wins, and he pitched a huge number of innings in a league with a short season: 4086. Many of the times that he posted league-leading figures, it was simply due to the large number of innings that he pitched. This is particularly true for the (many) times that he led the league in losses, including losing 25 games (still a Pacific League record) in 1972. In some ways it makes sense to think of Higashio’s career in two parts. During the first half of his career the Lions were terrible. He frequently led the league in losses, but also made a number of all-star teams and placed among the league leaders in ERA. During the latter half of his career the Lions blossomed (if you’ll excuse an odd metaphor). They won the Japan Series in 1982, and Higashio was named the series MVP. In 1983 they won the Japan Series again, led (again) by Higashio. After leading the league in losses on a bunch of occasions, he led the league in wins this year, and took home the Pacific League MVP award. In 1985 the Lions made it to the Japan Series again, but they lost this time. The disappointment didn’t last long. The next two seasons the Lions again won the Japan Series, with Higashio taking home another Pacific League MVP award in 1987. The following season the Lions won the Japan Series again – although by this point all the innings pitched had taken their toll on Higashio. He was relegated to part-time duty during the season, starting a game and making an appearance as a reliever in the Japan Series. Higashio was known to pitch inside, and was frequently accused of head-hunting. (He says that 90% of batters that he hit were hit accidentally. Which, of course, leaves the other 10%.) He holds the all-time record for hit batsmen in Japan, and famously received a beating from Richard Davis after hitting him with a pitch. Higashio was not ejected and continued pitching, eventually winning the game. He rubbed many people the wrong way. In part because he hit so many batters (and came so close to hitting others), but also because he is blunt when he speaks, and (by the standards of Japanese baseball) disrespectful of other players. After retiring Higashio took over managing duties of the Lions. He took them to two more Japan Series’, but they lost both times. He also had a Gameboy baseball game named after him (apparently only released in Japan) in 1991, and he and his daughter Riko (a professional golfer) do promotional work (e.g., for Guam Beer). The gossip pages report that Osamu is unhappy with Riko’s engagement to Junichi Ishida a twice-divorced actor who is 22 years older than she is. I don’t know why people care about this stuff. I mean, I know why Osamu cares about it, I don’t know why other people care that Osamu cares about it. Anyhow, the story that I found about it is 13 years old, so presumably Riko and Junichi are married by now. Hopefully Osamu got over it. My card is from the 1976 Calbee set. Most of the set has a standard Calbee look – full bleed photos with a little text at the bottom – but for some reason (or perhaps for no reason, I don’t know) a few of the cards have a pink frame around them. Including Mr. Higashio. Loving these posts, you must be 3/4 of the way there by now? Thanks Sean! The pace has slowed down recently, in part because a progressively higher percentage of the guys that I need are players from the early days of pro ball who didn’t play much (or at all) after the war. Those cards are hard to find. (The hall of famers who never played as pros I’m not including in this project.) So, I’m at 58% and have about a half-dozen cards on the way from Japan. But there’s still some low-hanging fruit out there, so I’ll keep chipping away at it. And I’ve got a sizable backlog of cards already in my collection that I haven’t written about yet. My apologies to Mr. Wakamatsu for missing his Wikipedia page. Searching for information in a language that you don’t read can be pretty hard, even with Google Translate around to help out! Today’s player is Shigeru Chiba. He was the second baseman for several versions of the Giants from 1938 to 1956. If his presence on cards from the early 50s is any indication, I take it that he was one of the bigger stars of the day. He was certainly a good hitter, regularly posting seasons that wouldn’t embarrass Chase Utley, even though he was playing through the middle of Japan’s deadball period. In particular he had extremely good on-base skills, walking far more than he struck out (and leading the league four times) and posting batting averages a bit under 300 (which was very good at the time). He’d also steal 15 or so bases in a year and hit 8-10 home runs. If I’d been his manager I’d have had him batting leadoff, or maybe second. Before going pro he had been a star amateur player in middle and high school. It amazes me that they took middle school baseball seriously. But they did. He made his pro debut at 19, but played only three seasons before going to war. Upon his return he took the league by storm, winning seven consecutive best nine awards. The coolest thing about Chiba is that he was nicknamed ‘The Formidable Buffalo’. Presumably this wasn’t done ironically, although he wasn’t an especially large guy. He’s listed at 5’6” and 140 lbs. Average male height in Japan in 1950 was 5’4”; I don’t have average weights from 1950, but 140 lbs. is a bit below average for today. So it sounds like he was probably a little bit larger than average. Anyhow, he’s got an awesome nickname. Albright compares Chiba to Joe Gordon and considers him the greatest second baseman in Japanese history. I don’t really think that the comparison is apt. They were very different kinds of players. Gordon was a slugger, Chiba wasn’t. Now, obviously there are very serious dissimilarities between these two, but purely for on-the-field stuff, a better comparison might be Jackie Robinson. Even on-field the comparison isn’t perfect, Robinson really was an extraordinary baseball player. But Chiba was the same kind of player, just less of it. The card is an uncatalogued menko. Somebody on QC duty messed this one up: look at the team name on his jersey. I'd write this off to the guy who designed the card not knowing English, but you don't need to know English to copy the jersey. Anyway, the card is hard to date since Chiba never changed teams and I don’t know of any other players in the set. I’m going to call it UNC Menko, c. 1950s and leave it at that. Masaaki Koyama was a great pitcher from 1953 to 1973. The first half of his career was spent with the Tigers, the second half with the Orions. The change in teams was the result of a blockbuster trade, he was dealt for Hirokazu Yamauchi, one of Japan’s great sluggers. He was a workhorse, throwing 4899 innings and winning 320 games. Both are extremely high totals for Japan. For his career he also posted a 2.45 ERA. The IP and win totals are 3rd all-time, as are his 3159 strike outs. He was an eleven-time all-star, and won the 1962 Sawamura Award. Although he managed to get to the pros at 18, his career didn’t start exactly as planned. He was a walk-on at a tryout for the Whales, but didn’t make the team. The teams that he played on weren’t bad exactly, he did make it to the Japan Series three times. But he lost each time. Perhaps the lack of post-season success might explain why he doesn’t have the same kind of standing that a guy like Victor Starfin has got? But then again, Starfin doesn’t have a near-Earth asteroid named after him, does he? Albright ranks him as the 9th best pitcher in Japanese history, and compares him to a bunch of American hall of famers. One of whom is Robin Roberts, which presents an interesting comparison. They were both durable and dominant. In context, though, I think that Koyama was the greater pitcher. mean "pitcher". The latter symbols translates as "hand" (according to Google), but it usually (or always?) turns up in specifications of a player's position. If you're looking at a card and trying to figure out what the kanji means, the bit with that symbol in it probably tells you his position. My card is a menko from the JCM 43a set. It’s a 1957 issue (so Koyama is still on the Tigers). Many sets very similar to this one were issued over a number of years, and it can be hard to pin down which set a particular card belongs to, but I think that I’ve got this one. I don't know what the back stamp means. Hideo Fujimoto was a star pitcher for the Giants (and one season with the Dragons) during the war and in the immediate postwar years. He pitched from 1942 to 1955, of course missing 1945 when the league was suspended. For his career he has an astonishing .697 winning percentage (200 wins to 87 losses). If an American team had a .697 winning percentage they’d win 113 games. In addition he is the all-time record holder for both career ERA (1.90) and seasonal ERA (0.73). He was Korean, which confuses me a bit, since I’m pretty sure that ‘Fujimoto’ is a Japanese name. Apparently his family moved to Japan when he was eight years old. In addition to being one of the finest pitchers in Japanese history, Fujimoto was a very skilled batter. He hit 245/319/327, which, you say “looks good for a pitcher”, but remember that the 1940s and early 50s were the Japanese deadball era. For example, in 1950 he posted an OPS of .808 against a league average of .727. It’s not that he was a good hitter for a pitcher, it’s that he was a good hitter period. There was a brief time (after his return to the Giants from the Dragons) when they experimented with him as an outfielder – it should be some indication of how highly his skill with the bat was respected that the Giants took one of the best pitchers to have ever lived and tried to make him an outfielder. In the end it didn’t stick (he played a total of 40 games in the outfield) and he went back to pitching full time. Unfortunately he had a relatively short career, and an even shorter peak. From 1942 to 1950 he regularly led the league in ERA and other pitching categories (at least when he threw enough innings to qualify). He continued to be a good pitcher for a few seasons after that, but never again led the league in anything. And then his career was abruptly over. In 1954 he pitched 19 innings, in 1955 he pitched five. And that was that. Maybe injuries were involved, I don’t know. In 1955 he was 35, which is old (for a baseball player!) but not that old. Here are two things that I don’t know about Fujimoto. Any knowledgeable readers, feel free to fill me in. (1) Why he didn’t get started until 1942. He was 24 years old in his rookie year. I had expected that it had something to do with the war, but I couldn’t find any confirmation that he was ever in the military. (2) Why he changed his name to ‘Nakagami’. You’d think that it would have something to do with being Korean, but, like I said above, I’m pretty sure that he’s got a Japanese name anyway. He changed his name in 1943 but it doesn’t seem to have stuck, because this card is from a few years later and uses his old name. Speaking of the card, it is a bromide from the JBR 73 set. The text on it is very hard to make out. On the far right it gives his name. The text on the left says something about "central". The first character is also the first character in 'Chunichi', the team he was with in 1947, but the second character in the team name doesn't appear. The hiragana in the middle of the card is illegible. Engel reports that this set was issued in 1947, but features pictures from 1946. He suggests that it was issued in the early spring of 1947. If so, that would make it the first postwar Japanese baseball card set. The immediate postwar period in Japan is fascinating. The allies heavily bombed the sixty (!) largest cities in Japan during the war (except for Kyoto, which was spared the atom bomb, and I think most conventional bombing as well). Poverty was so rife that the average height of Japanese men and women actually dropped in the postwar period. Moreover, the nation was occupied by American troops, and more-or-less run as McArthur’s fiefdom. (At least, IIRC the McArthur biography that I read, until Congress recalled him.) Granted the occupation had the blessing – or rather forced acquiescence – of the emperor, but it’s still a big deal. At Potsdam the allies demanded that Japan surrender unconditionally, Japan countered that they would surrender if (1) the emperor kept his throne, (2) there was to be no occupation, (3) Japan gets to keep Korea and Taiwan, and (4) the Japanese disarm their own armed forces. So, basically, they offered to not surrender at all. After a pair of atom bombs and Russian intervention they agreed to surrender provided that the emperor keeps this throne. It’s astonishing to me that that would be the condition that they would insist on – to this distant American view the other three seem to be much more important – and that they would rather have all of their cities erased and their county occupied by Stalin than lose their emperor. Anyway, the Americans accepted their offer, but not really. There is still an emperor in Japan, but he doesn’t have any power anymore. McArthur realized that having the traditional authority in place and willing to go along with the occupation would make things go much more smoothly in the postwar years, and it almost unquestionably did. Allied soldiers frequently remarked on how little opposition they faced after the peace treaty was signed. The relevance to all of this to a baseball card website is that this little bromide of Hideo Fujimoto comes from a completely different world. This card was printed in a bombed out, famine stricken country, which was occupied by a foreign military. Sure, things have also changed in America since my 1956 Topps Ernie Banks was printed, but the difference between America in 1956 and America in 2018 has just got nothing on the difference between Japan in 1946 and America in 2018. Thanks for continuing this series. The pink bordered cards were #325 - #396 of the 1975-76 series. The first 36 cards are the Pennant Race Stars and the next 36 are the Camp Series (training camp). Many of the series are given a theme name. If you notice on the back of the Higashio card, the line of text under the card number says Pennant Race Star in kana and a little kanji. The kanji for Walk is not nishi, it is the kanji for the number 4- it looks similar to nishi, but the kanji for 4 does not have any lines extending outside of the box like nishi does. The writing on the left side of Hideo Fujimoto's card says Chubu Dragons. Chubu Nippon is the full name of the company that owns the Chunichi Dragons, and they used it as the team name only in 1947. Last name changes usually happen due to marriage and men can choose to use their wife's name instead of their own. This is done for some complicated legal and inheritance reasons, and there are a few players that have done this. HOFer Kazuto Yamamoto became Kazuto Tsuruoka after playing his entire career as Yamamoto. He was already managing when he changed his name to Tsuruoka. Thanks again, this is the best series going on Net 54. Rickey Henderson is the Yutaka Fukumoto of America. Fukumoto was an outfielder for Hankyu from 1969 to 1988. He was blindingly, astoundingly, superlatively fast. He hit for a healthy average, knew how to draw a walk, and added a respectable amount of power. Once Rickey got on base, there was slightly less than a 27% chance that he would successfully steal a base. For Fukumoto, the odds were a bit better than 28%. Rickey was a better hitter than Fukumoto, but Fukumoto made up for it on the base paths. “But,” I hear you say, “it’s really hard to steal third (or home! ), maybe Rickey trails Fukumoto in your supposed measure of ‘base stealing ability’ because he got extra base hits so often!” No problem, let’s control for that. We can glean some interesting facts from these data. Fukumoto was noticeably better at stealing second base than was Rickey. He beats Rickey there by 32 points, whereas his lead in SB/times on base was only 14 points. If I’m thinking clearly (and maybe I’m not, I’ve got a pretty good cold right now) that means that Rickey must beat him somewhere to account for the 18 point difference between these two rates. So we can conclude that Fukumoto was more likely to steal a base than was Rickey, and a fair bit more likely to steal second given that he was on first (almost 10% more likely), but that Rickey was more likely to steal third, given that he was on second, than was Fukumoto. That’s really interesting. Raw speed could make up for a bad jump if you’re stealing second, but not if you’re stealing third. The throw from the catcher just isn’t long enough. This means that Rickey was probably better at reading pitchers and/or had quicker reaction times than Fukumoto. But since Fukumoto was the more successful base stealer over all (at least on a rate basis) that Fukumoto was probably the faster runner. Regarding Fukumoto himself. Here are some facts that are probably not surprising: he was a 17-time all-star, a 10-time member of the best nine, he won 12 consecutive gold glove awards, and an MVP award. His lead in career stolen bases is absurd, Yoshinori Hirose, in second place, has just under 600 steals. Just 60% of Fukumoto’s total. In addition to the stolen base record he is the all-time leader in triples, second in runs, and tied for fifth in hits. The card is another from the 76 Calbee set. And thanks Jeff, I appreciate the feedback! Last edited by nat; 08-08-2018 at 10:03 PM. Kaoru Bettoh was an outfielder with the Tigers and the Orions from 1948 to 1957. Perhaps just as importantly he had a 20 year career managing a variety of teams, mostly notably the Orions as a player-manager. Albright ranks him as the 17th most successful manager in Japanese history, but his ranking system is of the “assign 3 points for X, 2 points for Y” sort (a kind Bill James indulged in on more than one occasion), which doesn’t really measure anything. I think that the most accurate thing to say about his managing career is that it was long and had periods of sustained success. As a player Bettoh had a very high but very brief peak. In 1950 he slugged .671 in a league that slugged .384 as a whole. It was about 75% better than league average. To do that in 2018’s American League you would need to slug .728. That figure would place 27th all-time, behind Frank Thomas’ 1994 and Hack Wilson’s 1930. In 1950 he hit 35% of his team’s home runs. In short, he was a big slugger, and fast too, stealing forty bases one season. But he didn’t get to the JPBL until he was 27, and although he hung on for a couple more seasons, he was basically done at 33. And he was really only a superstar for a couple years. The late start seems to be a product of playing in the industrial leagues – which he must have absolutely dominated, but I don’t know where to find data on it, nor even if records were kept. Albright suggests that the war might have gotten in the way. I don’t know if he served or not, but he didn’t break in until 1948, so even if he was in the war, it doesn’t explain why he wasn’t playing in 46-7. Throughout the 20th century there were a number of attempts to bring together Japanese and American baseball, most notably the various American tours of Japan. The tours were not the only instances of Japanese/American cooperation, however. A number of Japanese teams came to spring training in the states, and every once in a while you’ll find a Japanese player who made a brief appearance in an American minor league. Walter O’Malley was especially active in these cooperative endeavors, taking the Dodgers on tour and bringing Japanese teams to train with them. Indeed, Bettoh spent the 1960 season with the Dodgers. It’s not clear what he was doing with them – he was retired as a player at that point and there’s no record of him doing any coaching for them. Perhaps he was just an observer. In any case, that was the end of his tenure with the Orions. He sat out the following season, before taking over managing Kintetsu. This must have been a change for him, the Orions were good, the Buffaloes were not. After going 55-91 in 1964 he lost his job, sat out a few years, and then took over the top job with the Whales. Bettoh was a graduate of Keio University, which had one of the top programs in the amateur era. Baseball-Reference has a list of players who attended Keio (and who went on to play professionally). I’m surprised by the lack of hall of famers, given the status of the program. I only noticed two others – Fujita and Mizuhara – and all three of them are in the hall largely for their work as managers. It is, of course, possible that this list in incomplete, but I expected a larger share of the early stars of Japanese baseball to have come through Keio. The card is an uncatalogued menko. Despite being uncatalogued we can do a pretty good job dating it. Bettoh is wearing a Tigers’ uniform, which places the card either in 1948 or 1949.